For this month’s crochet square pattern, I was inspired by the gingham pattern you see used for many blankets. I love the neat and geometrical look, and how it makes me think of country homes and picnics. 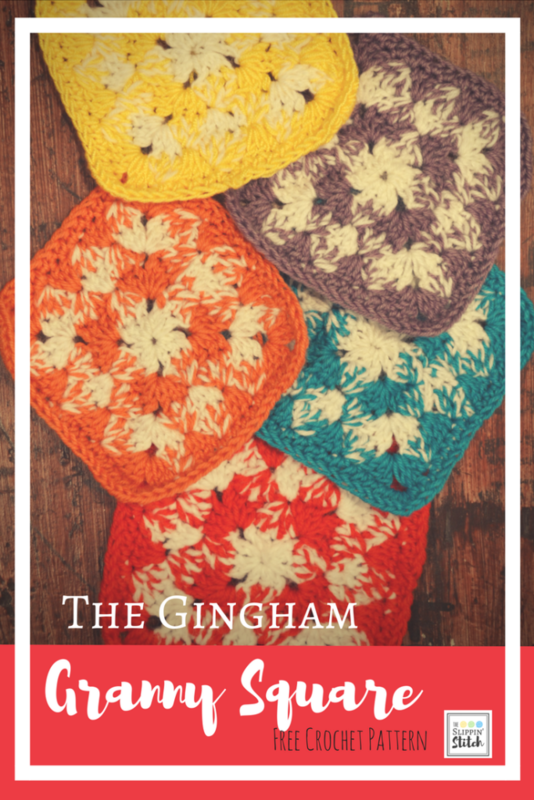 I’ve seen many granny square blankets that create the Gingham pattern by having one square in each colour, but I love a good challenge, so I asked myself if it would be possible to create a Gingham-like pattern, all within one granny square. I went to work, trying to figure out how I could make it happen. 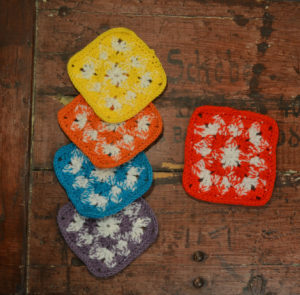 I wanted to stay close to a classic granny square, so went with sets 3 double crochets. The epiphany came when I realised that I had to fill in the spaces of a classic granny with the lighter colour. Instead of working with two colours plus white, I decided that I only wanted to have to deal with 2 yarns at the same time, so I went for the double thread option. Once you get the hang of when to drop and pick up certain colours it should hopefully be pretty simple. I’m looking forward to seeing how this would look in a blanket. You can choose any weight of yarn that you would like, just make sure to use the right hook to go with it. I’m left-handed, so in my photos, you’ll see me going clockwise, while right-handed people would be going counter-clockwise. The pattern involves crocheting with two yarns at the same time for some stitches. When you go from both colours to one, just continue with one colour and crocheting over the second one to carry the thread along. * … * 3 times means you need to repeat the steps between the asterisks 3 times. You’ll find pictures of each step at the bottom of the page. To the right is the illustration for the Gingham Granny Square. 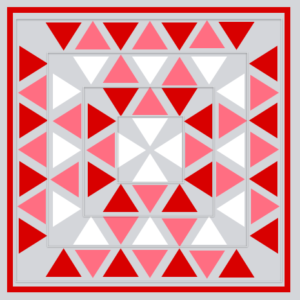 All the light red “pyramids” are the stitches where you’ll be working with the red and the white yarn together. They are all *double crochet 3 together*, so you’ll be doing the exact same stitch every time you’re working with two yarns. [white] Chain 3, 2 double crochets into first chain (the chain the furthest away from your hook), chain 2. 3 double crochets into first chain (same chain as before), chain 2. 3 double crochets into first chain (same chain as before), chain 2. Put your hook through the top of the beginning chain (the one before your first double crochet), yarn over with the white and also with the red, pull both colours through for a slip stitch. [white+red] chain 2, double crochet 2 together. [red] half double crochets all the way around, with 2 half double crochets in the chain space of each corner. I hope you’ve enjoyed the Gingham Square pattern. I’d love to hear about how yours turned out in the comments!